While many Facebook users in the U.S. and Canada are still crawling out of their beds, hundreds of people around the world have already started to “celebrate” this first edition of Upside Down Facebook Day. Impressive! The flipped Facebook status updates are extremely popular, but when I take a look at the guest list it appears that not everyone has recalled to rotate their profile picture. Or some are only rotating it halfway (90°), instead of completely upside down (180°). Check the simple instructions here to find out how you can easily flip your profile pic upside down… the result is interesting and often striking! Help spread the word and post about UDFD via your profile, tweet about #upsidedownfacebookday, and don’t forget to send in screenshots and reactions, like Rahoof, Gary and Cuiying already did. 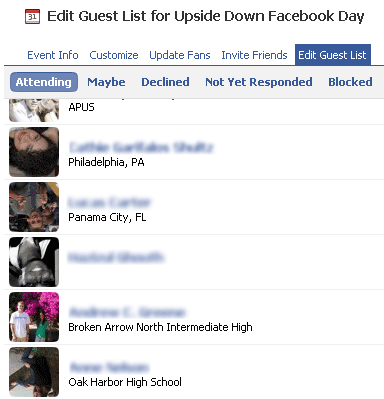 I also found an unofficial Upside Down Facebook Day event listing on Facebook with another 59 confirmed guests and 48 maybes… Cool, but it’s best to RSVP on the official event page. TIP: If you’re looking for inspiration for your upside down stats updates today, check out our Funny upside down Facebook Status Updates post. Posted by Pieter on June 9, 2009 at 2:05 PM. Use this trackback if you're linking this story.